Simple in design but effective, the BALERT is an alert system that works when someone, or something, breaks the beam between a reflector and sensor. Don’t want to worry about changing batteries or hard wiring a complicated system? 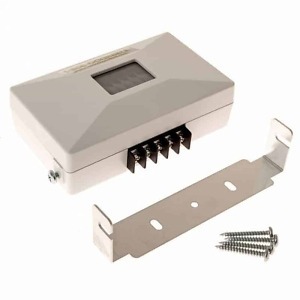 Connect the pieces of this photoelectric entry alert system together and plug it in. Never miss another visitor again. Do you need to know when an entry way, unauthorized areas, or exit is used? Entrance Alert Chimes have many different uses, such as home security, entrance notification, and motion detection. With a good entry alarm, you can easily monitor your business’ front door so you know when a customer enters with a pleasant and professional chime, or use as a motion detector alarm to warn of intrusion and deter theft. The kit is comprised of three main pieces, 1 x a reflector, 1 x a sensor, and 1 x a speaker/chime. The reflector and sensor are mounted on opposite ends of the entrance you would like to monitor. When the invisible beam between the reflector and sensor is broken, the sensor sends a signal to the wired chime (connected to the sensor) and a “ding-dong” or alarm sound is emitted. All components wire to each other, eliminating any need for hard-wiring. There are also add-on accessories available with the BALERT. Users can connect an electronic counter (connects to plug on speaker) that will count sensor triggers. Optionally, another speaker can be daisy-chained to the supplies speaker, extending the listening range of the product. If the distance between the speakers exceeds 33 feet, an additional power adaptor is needed. If an add-on speaker and add-on counter are added, an additional power supply is also needed. The technology used in the Seco-Larm BALERTproduct has been around for decades and it is still relevant today because the simplicity makes it an easy setup and easier to use. It’s reliable, relevant, and competitively priced. Check our full selection and find the alert that best meets your personal needs. Don’t miss our special discount pricing! Speaker has volume control knob that adjusts to 0-90 dB max @ 1 meter. Add-on accessories are available such as a speaker, counter, etc.